Tauranga Musical Theatre’s 2017 Baycourt production of Mary Poppins is an impressive feat, replete with all the magic of the original 1964 Disney film and more. The musical opens with Bert, a loveable member of London’s working poor, introducing us to Cherry Tree Lane, where the Banks family lives. Family patriarch George Banks works in finance, and has no time for his family, made up of wife Winifred and their unruly children, Jane and Michael. These little well-to-do rascals have driven a succession of nannies away from Number 17, and their parents are at their wits’ end. That’s when Mary Poppins blows in to shake things up. What follows is a series of songs and vignettes, some taken from the film, others from the book series upon which the film itself is based. 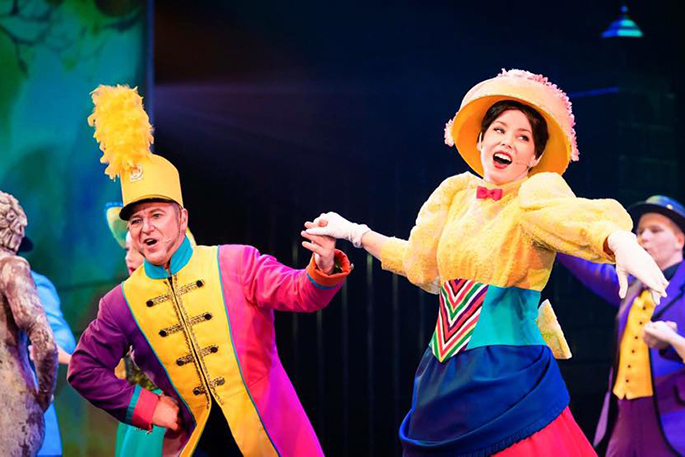 There are new numbers and old favourites, including the classic mouthful ‘Supercalifragilisticexpialidocious’ and toe-tapping ‘A Spoonful of Sugar’. For this reviewer, though, it was Bert’s optimistic tribute to Mary in ‘Jolly Holiday’ that brought back the strongest memories of childhood. Bert has all the best numbers. Apart from sporadic issues of audibility, the singing is very good. Sarah Toomer shines as Mary Poppins, hitting the high notes with apparent ease, and capturing the character’s unique blend of gentle kindness forever entombed within buttoned-up propriety. Reiss Jenkinson is a great entertainer as Bert. There’s a sense he’s not only genuinely enjoying himself on stage – he wants the audience to see the same magic he sees in the world. Jane and Michael (played on this particular evening by Eliza Ward and Hugo Corin) ably capture both sides of their brattish but sometimes rueful characters, while Mr and Mrs Banks (Fraser Graham and Melissa Nicholson) convey their own story arcs with great tenderness. The supporting cast all do an excellent job, from the cockney Banks servants of Mrs Brill (Sarah Bate) and Robertson Ay (Jaden McLeod), to Bob Blackwell in a dual role as Admiral Boom and the Bank Chairman. Jan Beets also commands the stage as the malicious Miss Andrew – a terrifying nanny whom Mary Poppins must dispatch. Special mention should go to the ensemble, who excel in numerous song-and-dance numbers, some tricky. The tap-dancing is something to look forward to – excellent choreography. Most spectacular for this show, though, is the set, which can only be described as a giant, intricate doll’s house. It perfectly suits the feel of the musical, and is sure to delight audiences when they first witness the scene changes. Great use of lighting and multimedia gives the show many of its ‘magical’ properties, quite literally. This is a great experience for families, particularly kids who’ve seen Disney on screen, but never the stage. Catch it in the evenings from Tuesday to Saturday, or at weekend matinees, at Baycourt until October 7.